Rose and walked Mix before breakfast. Olive and Digger had already left Mount Pleasant, driving to Fife to help Devon at Dunfermline and then to visit a charity whose accounts Olive checks over. 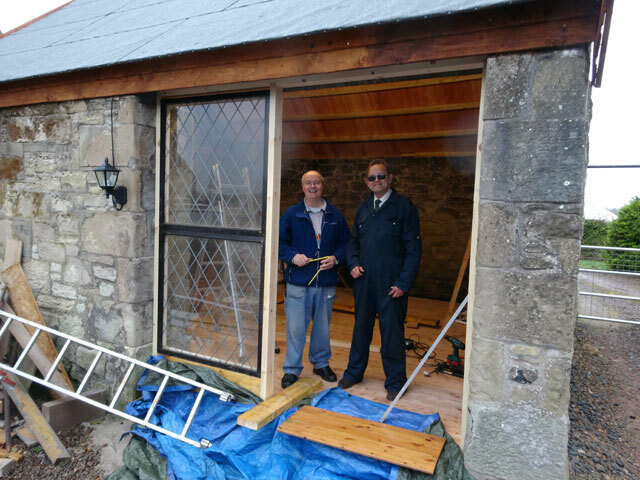 Tom and David arrived and we set about our task for today – working out what we are to do with the big hole in the front of the bothy, presumably made at some time in the past to enable a tractor to be garaged there. Having drawn up a plan on the back of an envelope, we went off to Pearsons to purchase the wood we required, some screws and hinges for the door. Then we started to try to fit the wood together. Stopped for lunch and afterwards fitted a frame and inserted the windows which Tom had rescued from a house renovation. Delighted with progress we called it a day (until tomorrow when our task will be to make a door and fit it all together). What enormous fun we are having. 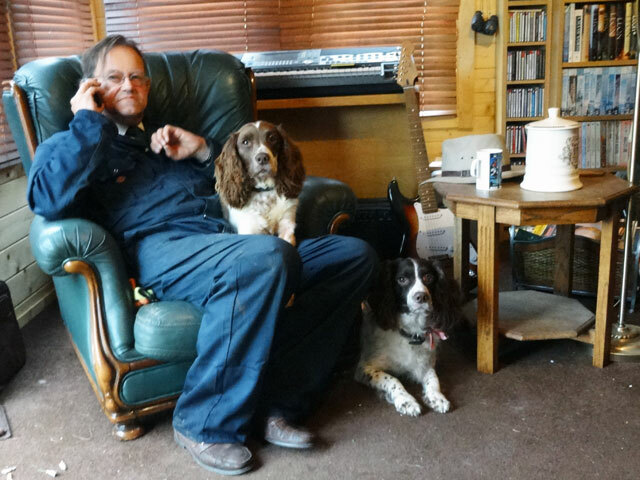 David is having more fun than most, having just got himself a rescue dog – a small spaniel called Nel. In the picture below he is pictured on the phone at lunch time with Nel on his lap and Sasha, the dog he shares with Rebecca, by his side. Olive and Digger returned home and later Rachel, Mum, Olive Digger and I ate in the farmhouse and later still (without Digger) met up in the Granary to watch Grantchester. I retired (having walked Mix) to continue reading. There is something especially pleasant about curling up in bed with a book on these nights in which the winds are howling and winter is getting closer. Should say that we seem to be extremely fortunate as regards weather. Everyone else seems to be having real downpours while we have escaped almost all of the heavy rain. This is a very good place in which to live.